These well crafted documentation phrases save you time by providing you with inspiration on how to phrase the skill you provide to your patients. You can copy and paste directly from the PDF, and modify the phrases to fit your documentation style and to reflect the skilled treatment you’ve provided. You get access to over 60 real assessment phrases and paragraphs used in actual therapy documentation. 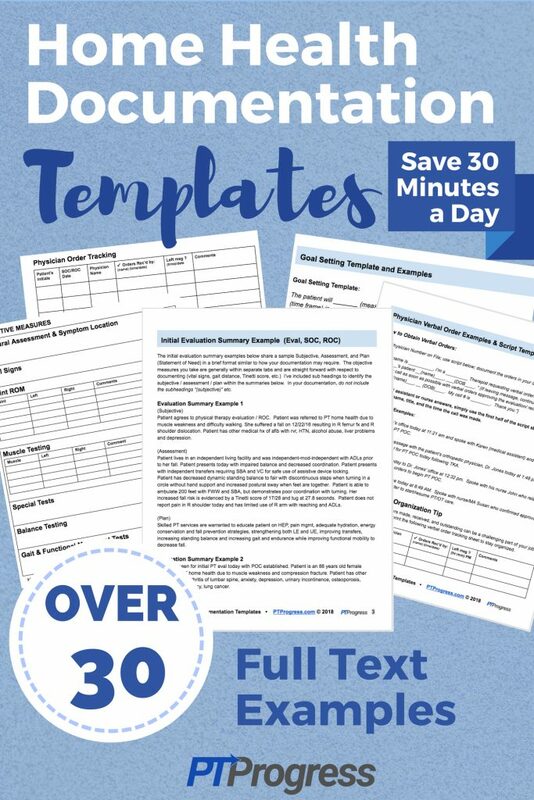 These templates simply give you the creative flow that you may be lacking at the end of a long day treating patients. Learn more about the therapy documentation templates here. These well crafted therapy goal phrases save you time by providing you with inspiration on how to phrase the therapy goals required for your treatment plan. You can copy and paste directly from the PDF, and modify the phrases to fit your documentation style and to reflect the goals you establish with your patient. 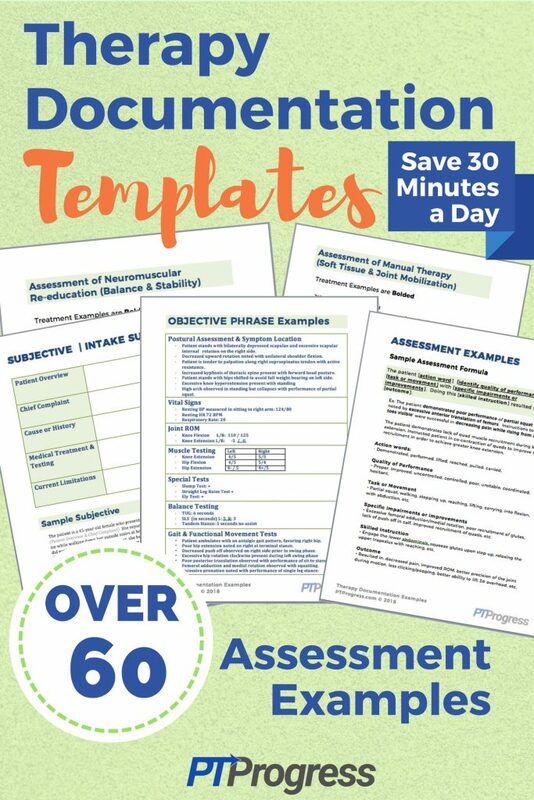 This goal template provides you with real goal template phrases and paragraphs used in making assessments of goals for progress and discharge note. Of course, you should always provide accurate documentation based on the skill you provided. You can spend an extra 30 minutes a day typing similar goals over and over. Or you can modify these templates to create a time saving system for documenting your skilled treatment. 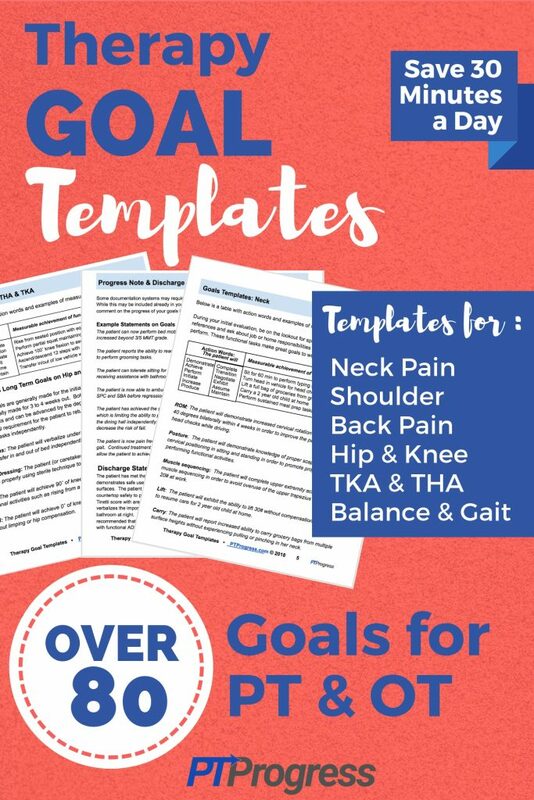 Learn more about the therapy goal templates here. If you’re a new home health therapist, this guide will save you time and headaches as you can actually spend more time focusing on the patient’s needs and treatment. If you are a veteran home health therapist, this guide can give you fresh ideas on ways to efficiently document your treatments. The goal setting examples are enough to save you at least 5 minutes per patient. With 6 patients a day, that saves you 30 minutes each day. Start your home health career off right with the first and only documentation guide available online. Written by a therapist, for therapists. Learn more about the home health documentation templates here. I absolutely love that quote and highly recommend investing in yourself through reading. Whether you’re reading a physical book or listening to the audiobook version, you will develop so much by reading even just one book a month. If you’re looking for inspirational reads, look no further! Here are the books we recommend that you read. This is, hands down, one of the best books you can read to develop or improve your interpersonal and relationship building skills. A must have for anyone looking to move up in an organization and to eventually lead a team. Looking to improve your interviewing and negotiating skills? Take a look at the book Crucial Conversations. Improve your personal financial competence as a healthcare provider and set yourself on a path to financial security with the tools outlined in Whitecoat Investor. A masterful book on improving productivity and time. I thought it would be helpful to create a page that you can visit for all your online marketing needs for your practice. I’ll try to add the latest resources as soon as they’re available, so be sure to bookmark this page as a reference. Disclosure: I personally use and love most of the recommended resources. Don’t feel obligated to purchase or sign up for every single resource on this list – that’s not what it’s for. Please know that I have worked with all of these companies personally and recommend them because they’re extremely useful, not because of the small commission I make if you decide to buy something from this list. This resource guide is to grow your business, so please take some time to learn about the best tools I can recommend. BlueHost – I’ve been with Bluehost for a while now and would absolutely recommend them because of their strong customer support and hosting platform. Not only is Bluehost affordable ($3.95 a month with our discounted link! ), you can count on them to keep your website running with their 24/7 support line and stable hosting services. Hostga tor – I’ve been using Hostgator for the last 6 years and recommend it to anyone looking to start a blog or website. Their customer service is top notch and they’re available to chat or talk 24/7. They will even help with transferring your old files to your new hosting account at Hostgator. How great is that! Check out the ‘Baby Plan’ or ‘Hatchling Plan’ and save 20%! ThemeForest – Everyone wants a great looking website. Picking the right WordPress theme is simple with ThemeForest. You can sort by customer rating, price, and even by specialty field. They have templates with shopping carts, photo galleries, and even magazine style themes. There are thousands of themes, many of them around the $50 mark. Elegant Themes – My first theme was from Elegant themes and I’ve been using them for multiple projects. They offer access to ALL their themes for one price. If you don’t want to commit to buying just one theme, check out the options at ElegantThemes. You can pay $69 and have access to all 87 themes. ConvertKit – If you haven’t started building your customer email list, you need to start today! ConvertKit is one of the best email newsletter services used by both small and large websites. Their customer support is great and the user interface is easy to learn.